cover:	Semi-submersible drilling rig in a shipyard in Cape Town, South Africa. 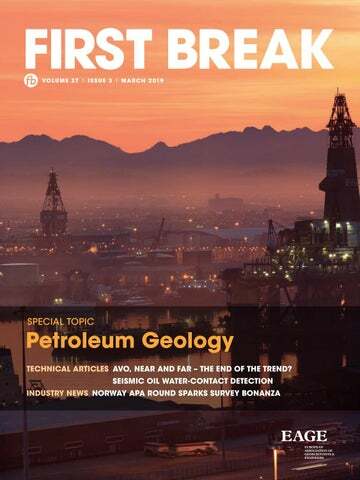 Our Special Topic in Petroleum Geology starts at p. 44 (James Jones Jr/Shutterstock.com). Companies can subscribe to First Break via an institutional subscription. Every subscription includes a monthly hard copy and online access to the full First Break archive for the requested number of online users. Orders for current subscriptions and back issues should be sent to EAGE Publications BV, Journal Subscriptions, PO Box 59, 3990 DB, Houten, The Netherlands. Tel: +31 (0)88 9955055, E-mail: subscriptions@eage.org, www.firstbreak.org. First Break is published by EAGE Publications BV, The Netherlands. However, responsibility for the opinions given and the statements made rests with the authors. COPYRIGHT & PHOTOCOPYING © 2018 EAGE All rights reserved. First Break or any part thereof may not be reproduced, stored in a retrieval system, or transcribed in any form or by any means, electronically or mechanically, including photocopying and recording, ­without the prior written permission of the Publisher. PAPER The Publisher’s policy is to use acid-free permanent paper (TCF), to the draft standard ISO/DIS/9706, made from sustainable ­forests using chlorine-free pulp (Nordic-Swan standard). Last month marked the 10th anniversary of the founding of the EAGE Student Fund (ESF), which has done so much with its mission to promote the geosciences amongst students and to help students bridge the gap between academia and industry. Through the ESF, much has changed since it began on 25 February 2009. Over the years we have reached thousands of students through student membership grants, giving them access to the EAGE network and services. With the help of the ESF, student activities across the globe have been made possible. In 2018 alone, the ESF reached students in over 50 countries and made possible student lecture tours at 12 universities. projector at the Annual Conference in 1988! Like me, many students who participated in ESF activities have become active members of the current EAGE and broader geoscience community. We are proud to say the ESF activities continue to help shape the geoscientist of tomorrow.’ The ESF’s role is to encourage geoscience students globally to achieve excellence in studies, extra-curricular skills and networking. In practical terms, the Fund works on this mission through a variety of activities including student conference programmes, membership grants, competitions and support for grassroot student activities at university level. The various activities help to stimulate international student networking and encourage them to develop their own projects and research presentations. Support our ESF @ 10 campaign The mission of the ESF remains pivotal as geoscientists will play a central role in the further development of our world, whether it is energy demand, environmental work, urbanization or infrastructure. To continue to provide our future leaders with the experience and skillset needed to excel, the ESF stimulates excellence in geoscience worldwide. This is only possible with the help of our supporters – both companies and individuals. We therefore encourage you to get involved in the ESF @ 10 campaign. Go to EAGEstudentfund.org/donate to support our mission and to learn more about our activities. application of both available and prospective bed-boundary mapping technologies while drilling in the traditional oil-bearing regions of Russia such as Western Siberia, as well as to determine further steps in development and application of the technology in Russia. During the round table, representatives of the main Russian geosteering centres will deliver reports on the best practices of miscellaneous data integration. They will talk about the application of seismic data, geophysical well logging, 3D petrophysical modelling, geological and geodynamic models, and the use of geological and engineering survey data for operational decision while drilling. EAGE acknowledges a mix-up at our handler, which resulted in our members receiving the First Break of January with an incorrect first name. This error has been spotted and steps have been taken to prevent this at our handler in the future. FOR MORE INFORMATION AND REGISTRATION PLEASE VISIT WWW.EAGE.ORG AND WWW.LEARNINGGEOSCIENCE.ORG. Want to discover what DUG McCloud can do for your business? Visit www.dug.com/dug-mccloud for more information. A big thank you to the 100+ attendees that joined us in Abu Dhabi! and multi-disciplinary approach for well placement/field development. The third day kicked off with a keynote by Dr G. AlQahtani (Saudi Aramco) on breaking the norms of geosteering and well placement. The key point was the promising direction in which the industry was heading regarding live modelling and IR 4.0. Incorporation of such innovations in sector models, well placement and associated workflow can truly revolutionize the way we currently work in addition to bringing greater rewards. The following session reviewed uncertainties in wellbore surveying and began with a presentation by BHGE. It emphasized utilizing geological markers to verify the wellbore vertical geometrical placement. ENI presented multiple case studies on wellbore trajectory uncertainty management for geosteering optimization. Petrolink further elaborated on quantification of survey deviation in real-time to prevent well collision. The next session showcased the vision for well placement and geosteering and where the industry is headed. International Research Institute of Stavanger (IRIS) demonstrated a methodology for effective earth model management while geosteering. In addition, a ‘myopic, naïve or farsighted’ approach to geosteering decisions was also presented. A fast integral equation method for inversion of electromagnetic data was shown by University of Bergen. It was then the turn of Equinor to discuss local 3D understanding around horizontal wells provided by deep 2D azimuthal resistivity inversions. Eni then introduced the opportunity in geosteering operations possible through real-time seismic calibration using ultra-deep azimuthal resistivity. BHGE finished the session illustrating the capabilities of boundary detection ahead of the bit through a sensitivity study of extra deep reservoir. The poster session included Daleel Petroleum showcasing geosteering within ultra-thin reservoirs. Schlumberger presented one poster dealing with resistivity inversion derived workflow from well placement to in-depth lithological reservoir development and another highlighting an integrated geosteering solution in a high uncertainty faulted reservoir in Oman. Saudi Aramco also presented on the rotary steerable directional tool for precision in unconventional resources. A complex deepwater reservoir in the Niger delta was illustrated by BHGE along with a poster by IRIS that presented an ensemble-based decision-support workflow for operational geosteering. enabling innovations; Multi-disciplinary integration for reservoir management and monitoring – dynamic and test data, geomechanics, real-time, petrophysics and rock typing; New acquisition technologies and their applications; and Beyond oil and gas: mining and mineral resources, environmental applications, geothermal wells. The deadline for submitting abstracts is 15 May 2019.
such as cloud computing, machine learning and advanced software algorithms, and hardware engineering are rapidly becoming integral to the petroleum business. Furthermore, with geoscience knowledge arguably at its all-time peak, the time is right to adopt a different mindset and shift to the new paradigm of SI. This is where practitioners can estimate, and continually revise, uncertainty in a more quantitative manner throughout the lifetime of a project leading to a more informed decision-making process. The Technical Committee invites practitioners, innovators and industry experts to contribute to this workshop and submit an abstract of 2-4 pages in length. 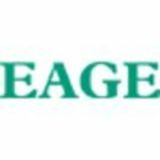 Abstracts should be submitted via the EAGE website using the downloadable template. The deadline for abstract submission is 30 April 2019. Team members of the EAGE SC Curtin University. geoscience research activities such as the implications of CO2 injection and unconventional resource exploration. Curtin University students say the vision of the Chapter is to engage with local and global industry as well other geoscience organization such as ASEG, PESA, SPE and SEG through organizing technical events, and workshops as well as mentoring and other relevant activities which directly benefit students to achieve their future goals. The mission is to narrow the communication gap between students, industry and research organizations and provide opportunities for students to enhance their technical and professional skills. Curtin University is Western Australia’s largest and most culturally diverse university with Australia’s third largest international student population. It is ranked in the top 1% of universities worldwide in the Academic Ranking of World Universities 2018. Connect with us to find out how digitally transformed workflows can accelerate your journey from data to discovery. Ukraine geoscientists prepares for busy year This year several EAGE events will be held in Ukraine. They will appeal to anyone interested in familiarizing themselves with the country, meeting with like-minded professional colleagues and of course connecting with Local Chapter Kiev. Things kick off with the longstanding conference ‘Geoinformatics: theoretical and applied aspects’ being organized in Kiev for no less than the eighteenth time on 13-16 May. This event is likely to be attended by over 250 international participants and is dedicated to innovative technologies in earth sciences. Local Chapter on a field excursion to the Chernobyl zone. Topics up for discussion include geoinformatics in nature management, governance and education, creation of integrated geological databases, data mining and decision support systems, mathematical methods and computer technologies for geophysics and geology, geoinformation research for petroleum and mineral exploration geological modelling, remote sensing in geosciences, application of unmanned aerial vehicle for modern geoinformation research and geoinformation support monitoring of hazardous natural and anthropogenic processes. floods and side erosion of river beds. Field equipment for the assessment of geohazards will be demonstrated here. On route participants will cross several structural and tectonic zones of Ukrainian Carpathians, including Subcarpathian Foredeep Trough, Folded Carpathians and Transcarpathian Deep Fault. There will be an the opportunity to see reference cross-sections of Cretaceous and Paleogene flysch deposits and Neogene volcanic suites. During the tour, participants will study landslides, debris flows and other geohazards, concluding with a city tour and a Ukrainian style dinner. Later in the year on 12-15 November, the 13th International Conference on the Environment (MGPECE) will take place at the Taras Shevchenko National University of Kiev. It will involve new approaches to using geological and geophysical methods as well as ecological analysis. In Ukraine, as in many European countries, discussions have actively begun regarding the development of seismic safety systems, as well as data-analytical systems for environmental monitoring of the atmosphere, surface and ground water, soil, landfills of highly radioactive and high-toxic wastes. Traditional topics to be presented will include: advanced technologies for geophysical monitoring, modelling of natural hazards and new technologies for risk minimization and prevention, GIS for monitoring of natural hazards, geophysics in engineering geology, soil science, archaeology, and assessment and prediction of landslides and mudflow risks on regional and local scale. During the conference, which is normally attended by over 200 delegates, a field excursion to the Chernobyl exclusion zone will take place, plus a tour to the State-owned EcoCentre and a visit to the observation deck of the New Safe Confinement. Students and young scientists are welcome to join. Jump start for Aberdeen Local Chapter 2019 programme! Aberdeen Local Chapter’s 2019 programme of events got off to a flying start with a fascinating description of naturally fractured reservoirs and some of the challenges faced in their development. The presenter was Dr Tim Wynn, lead geologist at AGR. Dr Wynn made a comparison between naturally fractured reservoirs and extreme sports such as BASE jumping and wingsuit flying. He argued that both are high-risk and require speed, effort, height and lots of specialized equipment. He then went on to describe several case studies from fractured reservoirs in the UK North Sea. Members of the audience left with fresh insights into multi-disciplinary working in characterizing these challenging reservoir types. Fifty people including many students attended the event at the University of Aberdeen, which fosters collaboration between the Local Chapter and the newly formed Student Chapter at the University. There was also a live broadcast to the Oslo Society of Exploration Geophysics (SEG) section members. BP, which has a keen interest in fractured reservoirs through its Clair Field development, West of Shetland, sponsored the event. First presentation of the year. a range of exciting events and building on their collaboration with other local societies. Profit from an additional journal subscription! As an EAGE member, you have free online access to a journal of your own choice. But did you know that it is also possible to subscribe to other EAGE scientific journals for a modest fee? gin successions with particular emphasis on clinothem architecture. Several other plenary talks and fieldtrips are scheduled throughout the year when Local Chapter Madrid and AGGEP members will have the opportunity to connect, share experiences, and have fun! cross pollination opportunities between data analytics, big data, AI, simulation and HPC is the underlying theme of this fourth rendition of our workshop with the theme of ‘HPC through the 4th Industrial Revolution’. The technical committee invites industry experts, practitioners and academia to submit abstracts before 1 May 2019. Please visit the workshop website for more information on topics of interest and how to submit your paper. hydro-electric epitomized by the Three Gorges Dam project, as forays in countries such as Thailand, Peru, Sudan, Khazakstan, Iraq well as solar and wind energy. China has pledged to source 10% of and Venezuela until a hiatus around the 1999-2000 oil crisis. its energy demands from natural gas by 2020, is extremely active When outbound investment returned to favour, the limits in the LNG market, and is adding to its nuclear capacity. Up its to China’s investment aspirations were revealed when its $18.5 sleeve, there are also the world’s largest, but problematic, shale billion bid for US-based Unocal floundered amid protectionist reserves to tap. and national security objections in Washington. These won the None of this alters China’s oil vulnerability. According to an day and allowed Chevron to take over the company with a lower assessment by the ChinaPower project of the Washington-based offer. More recently CNOOC was more fortunate with its $15.1 Center for Strategic and International Studies, ‘Power can be billion takeover in 2017 of Nexen with no objection from Canadian derived from a country’s ability to leverage its resources toward regulators. economic and political gains. Conversely, dependency on foreign Dr Meidan unravels in almost excruciating detail the constant resources—such as energy—restricts policy options’ internal wrangling in the controlling central bureaucracy between The Middle East represents an important energy security the market-oriented and conservative elements. This resulted in concern for China. Already roughly half of China’s oil imports frequent restructuring, reforms, leadership reshuffles and policy come from the region and the International Energy Agency predicts hesitations, not to mention massive corruption scandals, among that China will double its Middle East imports by 2035. In recent other things regarding the actual return on foreign investments. years both Iran and Iraq have become important sources of crude. She predicts that, with domestic production facing gradual decline, China has been diversifying its oil portfolio worlwide, most greater emphasis on oil trading opportunities in the future but a conspicuously by investment in Africa although the potential more cautious approach to spending on assets abroad. reserves do not compare with the Middle East. China has pursued In this context BGP must be one of the great success stories a strategy of offering economic development loans to African states of the Chinese oil industry if only for surviving where most of its in exchange for access to oil. international rivals have fallen by the wayside. How the oil shortage reality dawned on The comparison is not entirely fair because ‘BGP must be one successive regimes in China is well captured in the company operates under a state-controlled of the great success entity in CNPC and arguably fulfills a strategic a 2016 study by Michal Meidan, The structure of China’s oil industry: Past trends and future stories of the Chinese objective beyond the entrepreneurial. Even if prospects, published by the Oxford Institute for it has enjoyed a measure of protection from oil industry.’ Energy Studies. She provides an erudite, deep market volatility, the company’s record in the dive into the internal agonizing by successive onshore seismic sphere has been enviable. It Chinese regimes over the challenge of oil development at home had over 30 years of operating crews at home before it began a and, eventually, the doctrinal correctness and changing perspecfirst survey overseas in Ecuador in 1994. But by 2003 on its own tives on the potential benefits of overseas operations. reckoning it had become the largest land and shallow contractor in Chairman Mao Zedong got a first taste of energy insecurity the world. as early as 1950 during the Korean War when a western-inspired Not always blessed with stat- of-the-art equipment, BGP anti-communist oil embargo forced the country to depend on gained market share by offering low priced services, a large workeastern European and Soviet exports. As part of the Mao’s Soviet force and a willingness to work in countries regarded by traditional model industrialization programme a Ministry of Petroleum was western-oriented seismic companies as difficult by way of politics, established with the brief to intensify the quest for domestic oil security or terrain. Outside North America, the company dominates resources. Oil production in the 1960s and 1970s was rapid but not the international onshore market and has long experience in the efficient, lacking the most modern technology and hampered by lucrative Middle East, where WesternGeco and CGG have recently the behavioural demands of the Cultural Revolution. In the wake withdrawn. of the economic reforms introduced after Mao’s death in 1978, Offshore, it has been a different story with the company the big three national oil entities came into being. In 1985 foreign apparently reluctant to pour money into towed-streamer acquisition oil companies were invited to participate in the development of systems. However, four of its fleet of six vessels regularly provide China’s oil resources, particularly offshore, with a number of seismic data in the international marketplace, often for multi-client international bidding rounds. projects where a competitive price wins the acquisition contract. Between 1991 and 1997 China took its first steps in internaBGP clearly regards itself as better suited for the ocean bottom tional oil and gas ventures. The first move saw CNPC participate seismic market, with a fit for purpose or availability approach to in an UN-sponsored oil sand project in Alberta, Canada in 1991 the equipment it uses. The company is currently active offshore resulting two years later in the first barrel of overseas crude in ChiNigeria and in the Caspian Sea, and now takes on the massive nese history. CNPC led most of the subsequent foreign investment ADNOC survey. There is no Chinese puzzle about its intentions. Views expressed in Crosstalk are solely those of the author, who can be contacted at andrew@andrewmcbarnet.com. APA licensing round sparks seismic survey bonanza A raft of seismic surveys will be commissioned as work programme commitments on the Norwegian Continental Shelf after the country offered 83 production licences after its Award in Predefined Areas 2018 (APA 2018). The 83 production licenses are distributed over the North Sea (37), the Norwegian Sea (32) and the Barents Sea (14). Thirty three oil companies have been awarded ownership interests. Twenty one of these companies will be offered operatorships. The APA licensing rounds cover the most explored areas on the Norwegian shelf. As a consequence of the fact that exploration has been going on for decades, the majority of the North Sea, large parts of the Norwegian Sea and an ever-increasing area in the Barents Sea is today included in the APA-rounds. The Companies awarded licences/operatorships are: Aker BP (21/11); AS Norske Shell (4/2); Capricorn (1/0); Chrysaor (2/0); Concedo (3/0); ConocoPhillips (3/3); DEA (9/3); DNO (18/5); Dyas (1/0); Edison (4/2); Equinor (29/13); Faroe (8/4); Idemitsu (1/0); INEOS (6/2); Inpex (3/0); Lime (1/0); Lundin (15/9); M Vest (4/0); MOL (1/0); Neptune (9/4); OKEA (4/3); OMV (11/6); Pandion (2/0); Petrolia NOCO (5/1); PGNiG (3/2); Repsol (4/2); Source (2/0); Spirit (9/2); Suncor (4/2); Total (2/1); Vår Energi (13/4); Wellesley (6/0); Wintershall (6/2). and Equinor (35%) on 997; Equinor (70%) Neptune (30%) on 999; Equinor (70%) and Faroe (30%) on 1006; Faroe (40%), OMV (20%), Spirit (20%) and Equinor (20%) on 1007; DEA (60%) and Vår Energi (40%) on 1010; BP (40%), Concedo (30%) and DNO (30%) on 1022. Consortiums required to acquire modern 3D broadband seismic include: DNO (60%) and Equinor (40%) on 967; DNO (40%), Source Energy (30%) and Vår (30%) on 984; DEA (40%), Lundin (30%) and Concedo (30%) on 989; Spirit (40%), Lundin (30%), Petrolia NOCO (20%) Neptune (10%) will acquire newly reprocessed 3D seismic on 998. Consortiums required to acquire and reprocess 3D seismic data include Neptune (40%); Suncor (30%), DEA (30%) on 1000;ConocoPhillips (60%); OKEA (20%) and Vår (20%) on 1001; Edison (60%) Neptune (40%) on 1002; OKEA (60%) and Wellesley (40%) on 1003; Lundin (40%), Inpex (20%), DEA (20%) and DNO (20%) on 1027;and Lundin (40%), DNO (40%) and Spirit Energy (20%) on 1029. OMV (70%) and Wintershall (30%) will acquire and reprocess geophysical data on 1004 Consortiums required to acquire 2D seismic are Ineos (70%) and DNO (30%) on 1015; and Wintershall (40%) OMV (25%) and Equinor (35%) on 1020. DEA (50%) and DNO (50%) will reprocess 3D seismic and consider acquisition of reprocessed 3D seismic on 1021. Repsol (70%) and DNO (30%) will reprocess 3D seismic and on making a decision acquire 3D seismic data or drill or drop on 1024. Spirit Energy (40%), Petoro (20%), BP (20%) Equinor (20%) will acquire EM data on 1031. ‘This is the largest licensing award on the Norwegian continental shelf. 53 years after the first licensing round, this new record confirms the industry’s belief in continued value creation and activity in Norway,’ says Minister of Petroleum and Energy, Mr. Kjell-Børge Freiberg (FrP). PGS processes promising offshore Nigeria dataset PGS is producing the first 3D PDSM dataset in Nigerian waters in Q2 2019 at its UK imaging centre. PGS uses the Cray supercomputer. the Post-Akata exploration. The Sub-Akata exploration is revisited using the Sub-Akata seismic package new imaging. Structures at the Base Akata level are obvious traps that the depth migration reveals. The exciting untested Sub-Akata play comprises a potential Sub-Akata source rock, syn-rift and syn-transform structures, filled and draped by syn-kinematic Upper Cretaceous clastic sediments, and intraformational shales acting as seals. The wrench zone overall morphology and the complex fault networks associated with the long-lived major Chain transform fault are key structural observations that are better imaged and accurately positioned in the depth domain. Post and Sub Akata plays evaluations will benefit from the new structural analysis of the above structural observations. Revitalization of the data will be achieved using the latest processing and imaging algorithms. A suite of optimized denoising algorithms, coupled with a full deghosting sequence, will improve the data bandwidth and signal-to-noise ratio. The multiple attenuation sequence will use a combination of 3D techniques to eliminate complex multiples. A full velocity model building sequence in the depth domain, together with a depth migration, will improve the image integrity in this structurally challenging environment. the region, especially as its near-shore location means it could be brought on stream quickly, strengthening Egypt’s gas export prospects. Nour’s resource is estimated to be about 860 million boe. Chevron Kingsholm-1 prospect in the US Gulf of Mexico’s prolific Mississippi Canyon holds an estimated 300 million boe. The Jethro prospect on the Orinduik Block, offshore Guyana, is on acreage adjacent to ExxonMobil’s prolific Stabroek Block and will target a 200 million boe prospect in the same play as the recent Hammerhead find. Total’s Venus-1 well, in a giant Cretaceous fan play in Namibia’s ultra-deep offshore has the potential to be the year’s largest discovery. However, the exploration sector will continue to be an exclusive club in 2019. Fewer companies are drilling fewer wells. ‘Even as average exploration returns rise to double digits, newcomers will be few and far between. If anything, the current corporate landscape will continue to narrow,’ Dr Latham said. Despite a stronger oil price and lower cost base, global exploration and appraisal spending for 2019 will stay close to its 2018 level of just under $40 billion,’ Dr Latham said. value from our production of renewable electricity and supports our aim to grow in profitable new energy solutions. DC’s market presence and expertise in energy trading complements Equinor’s position as the second-largest supplier of natural gas to Europe and as one of the world’s largest net-sellers of crude oil,’ said Irene Rummelhoff, Equinor’s executive vice-president for marketing, midstream and processing. As a wholly-owned subsidiary of Equinor, Danske Commodities will continue to operate under its own name and brand while increasingly collaborating across relevant commercial and operational activities with Equinor. The transaction also includes smaller contingent payments that are depending on Danske Commodities performance over the next couple of years. totalling 7.4 terabytes of data by 34 different companies. Dr Andy Samuel, chief executive of the OGA said: ‘We are encouraging prospective operators to look beyond individual opportunities and actively partner with other companies to establish a mutually beneficial Area Plan realising the full economic potential in the area.’ A newly created ‘Buchan Field Production Dashboard’ is also available on the OGA’s Open Data site which shows the entire production profile since 1981. This can be viewed via the link: http:// data-ogauthority.opendata.arcgis.com/ pages/buchan-sup-round-dashboard. Decommisioning of the Welland platform in the North Sea. reserves are running out and tax revenues from production have declined significantly over the past decade. Oil and gas operators in the UK have spent more than $1.3 billion on decommissioning their infrastructure since 2014. The UK government allows operators to recover some of this expenditure through tax reliefs, by deducting costs from their taxable profits and potentially claiming back some taxes they have previously paid. Tax revenues from oil and gas have declined from a recent high in 2011-12 due to lower oil and gas prices and operators incurring high levels of expenditure that is tax deductible. In 2016-17, the government paid out more to oil and gas operators in tax reliefs than it received in revenues, resulting in total repayments of $380 million. The Office for Budget Responsibility expects net annual receipts from the oil and gas sector to recover slightly, rising from $1.6 billion in 201718 to a projected $3.2 billion in 2022-23. The UK Oil & Gas Authority (OGA) estimates that decommissioning will cost UK operators a total of between $60 billion and $100 billion. The UK Inland Revenue forecasts that associated tax reliefs will cost the UK taxpayer approximately $31 billion from 2018-19 to 2062-63. The total cost of decommissioning to taxpayers could be higher because the government is ultimately liable for the cost of decommissioning assets that operators lack the financial resources to decommission. The UK government has acted to mitigate this risk by requiring nine operators to set aside a total of $1.1 billion to pay for decommissioning in the future. E&P Business Development. ’The Round 16 area covered by the Farofa programme has extremely complex salt bodies that overlie and mask the extent of the presalt play. The complex nature of this area creates challenges in imaging relative to the inboard part of the Campos Basin, making it an exciting opportunity for new exploration. After the survey Ion will hold 75,000 km2 of 3D data and 85,000 km of 2D data offshore Brazil. BP’s investment will enable Belmont Technology to expand its workforce, extend Sandy’s capabilities and accelerate the deployment of its product. Belmont Technology’s CEO, Jean-Marie Laigle, said: ‘Our technology enables real-time thinking for subsurface engineers, helping to transform the way teams work, analyse data, understand situations and generate novel ideas.’ This investment follows BP’s previous deals in cognitive computing, including $20 million funding of AI company Beyond Limits. That investment is helping to deploy AI technology previously used in deep space exploration missions in offshore exploration, to accelerate operational insight and process automation across operations. the Eagle Ford, average lateral length only increased by 5% (97 m) in 2018, compared to 8% (158 m) in 2017. Lastly, the Permian basin also increased 5% (112 m) in 2018 compared to 6% (140 m) in 2017. Assuming a $60-70 WTI oil price range over the next few years, completion activities look set to grow through to 2022 in the US. US rig count is up by 17%. shallow to ultra-deepwater, providing ties to all existing wells and allowing a complete evaluation of the available acreage. Sierra Leone has proven oil discoveries and this new long-offset survey will highlight the potential of this underexplored area’. that increased interest outside of Norway has translated to increased commercial activity, resulting in a positive EBITDA for the quarter,’ said Bjørn Petter Lindhom, CEO of EMGS. For the full year of 2018 PGS reported an operating profit of $36 million on revenues of $845 million compared to an operating loss of $148 million on revenues of $839 million in 2017. Total Segment multi-client revenues of $654.3 million, up 22% compared to 2017. Record Segment multi-client late sales revenues of $371.9 million, were up 58% compared to 2017 Cash flow from operations of $445.9 million, compared to $281.8 million in 2017. In 2019 PGS expects an increase in exploration and production spending to contribute to further recovery of the marine seismic market. Contract seismic is likely the activity benefiting most from the improvement, driven by more 4D acquisition and generally higher demand for new seismic data. PGS expects full year 2019 gross cash costs of approximately $550 million. 2019 multi-client cash investments are expected to be approximately $250 million. More than 50% of 2019 active 3D vessel time is expected to be allocated to multi-client acquisition. Capital expenditure for 2019 is expected to be approximately $85 million, which includes the reactivation of the vessel Ramform Vanguard. The order book totaled $163 million at 31 December, 2018 (including $59 million relating to multi-client), compared to $144 million at 30 September, 2018 and $135 million at 31 December, 2017. Oil majors report improved profits Oil majors’ fourth quarter 2018 results show dramatic improvements on the same period in 2017. Equinor has reported earnings of $4.4 billion and $1.5 billion after tax in the fourth quarter of 2018, up from $4 billion and $1.3 billion in the same period of 2017. For the full year, adjusted earnings were $18 billion, up 42% from $12.6 billion in 2017. IFRS net income was $7.5 billion, up from $4.6 billion in 2017. ‘In 2018 we sanctioned seven new projects, which will deliver more than 1 billion barrels of resources to Equinor at an average break-even price of $14,’ said Eldar Sætre, president and CEO of Equinor. Equinor delivered all-time high production in 2018 with an underlying production growth of more than 2%. It completed 24 exploration wells with nine commercial discoveries. Exploration expenses in the quarter were $417 million, up from $274 million in the same quarter of 2017, mainly due to higher seismic and drilling activity. Capital expenditure was $9.9 billion for the full year of 2018. In 2019 Equinor expects capex of around $11 billion. reported for 2017. The fourth quarter result was $3.5 billion. Return on average capital employed was 11.2% compared to 5.8% in 2017. Oil and gas production averaged 3.7 million barrels of oil equivalent a day for 2018. Upstream underlying production, which excludes Rosneft, was 8.2% higher than 2017. Six Upstream major projects started up in 2018, making a total of 19 brought online since 2016. Chevron has reported earnings of $3.7 billion for fourth quarter 2018, compared with $3.1 billion in the fourth quarter of 2017. Full-year 2018 earnings were $14.8 billion, compared with $9.2 billion in 2017. Fourth quarter 2018 revenues were $40 billion, compared to $36 billion in Q4 2017. Record annual net oil-equivalent production of 2.93 million barrels per day is 7% higher than a year earlier. The company is targeting growth 4-7% growth for 2019 Royal Dutch Shell has reported fourth quarter 2018 earnings of $5.7 billion. Full year earnings were $21.4 billion. TGS shoots onshore 3D survey in Wyoming TGS has announced the Railgun onshore 3D seismic survey within the US Powder River Basin. geologic products which include a fully interpreted regional basin stratigraphic model that is analytics-ready, derived from an extensive library of high-quality well data. More than 41,000 LAS logs and over 145,000 raster logs are immediately available for the Powder River Basin. ‘TGS’ entry into the Powder River Basin is consistent with our strategy to identify prolific and high potential onshore plays where the application of modern seismic data can deliver significant benefits to the exploration and production of hydrocarbons,’ stated Kristian Johansen, CEO for TGS. UK’s first horizontal shale gas well yields good results Cuadrilla has reported that flow-testing from the UK’s first horizontal shale well shows a rich reservoir of recoverable high-quality gas present. The company drilled through the shale rock more than 7500 feet beneath the Preston New Road exploration site in Lancashire in the north of the UK. Chief executive officer Francis Egan said: ‘We have also confirmed that the Bowland shale formation fractures in a way that, from US experience, is typical of an excellent shale gas reservoir. A complex fracture network was generated in the shale and sand injected into the fractures has stayed in place during flow back. Also the natural gas flowing to surface from the shale has a very high methane content, which means it could be delivered into the local gas grid for the benefit of local consumers with minimal processing required.’ A microseismic operating limit during hydraulic fracturing, set at 0.5 on the Richter Scale, had, however, severely constrained the volume of sand that could be injected into the shale rock. set ever collected at a shale gas well anywhere in the world.’ In addition to microseismic data, Cuadrilla recorded ground vibration levels throughout fracturing operations. The vast majority of those vibrations were less than 0.5 mm/second which the company has highlighted is up to 30 times lower than limits applied to other UK industrial operations, including quarrying and construction. Egan added: ’The potential for Lancashire and the UK has again been clearly demonstrated by the fracturing and flow-testing carried out at Preston New Road. We look forward to completing the job. ‘All we ask now is that we are treated fairly, with comparable seismic and ground vibration levels to similar industries in Lancashire and elsewhere in the UK who are able to work safely but more effectively with significantly higher thresholds for seismicity and ground vibration.’ Cuadrilla has now shut in the well and will monitor build-up as it continues to assess the results. 2018 with as many as 18 blocks and five CBM blocks, measuring 31,722 km2, being sought. About 90,000 km2 of India’s sedimentary basin was under exploration prior to these bid rounds. In two OALP rounds and two discovered small field (DSF) rounds, the area under exploration has more than doubled. Shearwater wins big OBS contracts in the North Sea Shearwater has been awarded four ocean bottom seismic (OBS) surveys from Aker BP and Equinor. BRIEFS CNNOC (50% operator), Total (25%) and Euroil (25%) have made a new discovery at the Glengorm Prospect, offshore UK Central North Sea. In water depth of 86 m, the exploration well in Licence P2215 was drilled to a total depth of 5056 m and encountered net gas and condensate pay zones with a total thickness of 37.6 m. Recoverable resources are estimated to be close to 250 million barrels of oil equivalent. three surveys to be conducted in 2019 at the Frosk, Ivar Aasen and Valhall fields. The first survey is scheduled to start in Q2 and the total duration for the three 2019 projects is estimated at around four months. Equinor has awarded Shearwater an OBS survey over the Gullfaks field in Norway, with start-up in Q3 and an estimated duration of 1 month. ‘These awards secure backlog for the full North Sea summer season for two of our OBS vessel platforms and cement our strong position in the OBS market. We are pleased to see strategically important customers acknowledge this position by awarding additional projects for follow-on seasons,’ said Irene Waage Basili, CEO of Shearwater GeoServices. Shearwater will utilize the multi-purpose vessels WG Tasman and WG Cook on the surveys, using its Q-Seabed OBS system. Polarcus has been awarded a 3D marine seismic acquisition project in West Africa. The project will start in Q1 2019 and last for six weeks. Polarcus has also been awarded a 3D survey offshore Mexico. The 45-day project is due to start in Q2 2019. ConocoPhillips has ended exclusive talks with Ineos over a package of North Sea assets and will open up the sale to other bidders. The company is engaging with other parties for the oil fields in the UK. The assets are valued at $3 billion. Ineos accuses UK of ‘shutting down shale’ Ineos has called for the UK government to ‘make shale workable or shut it down and not to use politically expedient, slippery back door manoeuvres to end shale’. The company said there are indications that there may be enough gas to make the UK self-sufficient in energy for a generation and stimulate huge investment, but that the industry is threatened by the government’s ‘absurd seismic thresholds’ for shale. UK planning policy remains ‘archaic, glacially slow, inordinately expensive and virtually unworkable’. In the US, where more than a million shale wells have been drilled, the seismicity limit is typically set at 4.0 on the Richter Scale. The UK Government has set the level at 0.5 with ‘no sound basis in science and betraying a total lack of understanding of the shale extraction process’, said Ineos. The Abu Dhabi National Oil Company (ADNOC) has awarded Onshore Block 3 to Occidental Petroleum. Onshore Block 3 covers an area of 5782 km2 in the Al Dhafra region. Existing 3D seismic data already covers a large part of the block which, with its proximity to the Shah, Asab, Haliba and Sahl fields, suggests very promising potential. Occidental will hold a 100% stake in the exploration phase, and invest $244 million. ADNOC has the option to hold a 60% stake in the production phase. Total’s South African offshore gas condensate discovery in the Outeniqua basin could contain 1 billion barrels of total resources. Eni Australia has acquired a solar photovoltaic (PV) project near Katherine, in the Northern Territory of Australia, from Katherine Solar Pty Ltd, a joint venture between Australia’s Epuron and the UK-based Island Green Power. Cuadrilla site at Preston New Road. but the secretary of state said highway safety issues have not been ‘satisfactorily addressed’ and refused planning permission. A spokesperson for Cuadrilla said: ‘We are naturally disappointed about the decision on Roseacre Wood and will examine the details in full before reaching a position.’ Cuadrilla submitted a planning application to drill, hydraulically fracture and test the flow of natural gas from up to four horizontal wells to Lancashire County Council in 2014. Permission was denied in 2015 and Cuadrilla appealed this decision and the matter was subsequently heard at a public inquiry in early 2016. The inquiry was reopened in April 2018 to hear evidence on highway safety. be drilled, Egypt’s petroleum ministry said. Egyptian General Petroleum Corporation’s tender included areas in the Western Desert, the Nile Valley, the Gulf of Suez and the Eastern Desert. Egypt expects investments of at least $750 million to $800 million in the first stage of exploration in the total of 12 concessions announced, Petroleum Minister Tarek El Molla said. Visit www.eage.org for more information on the submission process. We build better subsurface images by reprocessing with more advanced tools. Our latest processing and imaging techniques, combined with increased compute power, allow us to extract more details from existing data. Visit our website to find out how we can tailor your data rejuvenation.